In a rent to own agreement, you, as the buyer, freeze the price on the home for a year or two in advance of when you’ve agreed to close on the purchase. Since most markets appreciate, you’re locking in a good deal with built in equity. During your time as a tenant buyer, you’re making payments that contribute toward the down payment of the sales price. It’s like a built in savings account that you cannot touch. You also have the ability to test drive the house, the neighborhood, the school system, etc, prior to buying. If it turns out you were wrong about the whole thing, renting to own is a lot less expensive than purchasing the house outright and finding out you’re stuck with it later. The extended closing date allows you the time to clear up any credit issues, save down payment money, and get pre-qualified for a loan. When you meet with a mortgage broker you’ll understand the amount of debt you can shoulder each month and still be approved for a loan. You’ll also discuss down payments and loan types, making you a well informed future borrower. 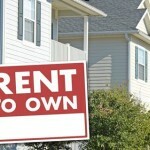 Essentially, renting to own gives you the time to get your finances in order while you’re living in your dream home. If you’re ready to see how this could work for you, contact us and we’ll answer all your questions.